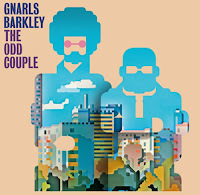 You can download Gnarls Barkley's latest album 'elpuoC ddO ehT' for free right now but there's one catch... it's backwards. The Cee-Lo Green and Danger Mouse duo have just released 'elpuoC ddO ehT', the backwards version of 'The Odd Couple', which was released last month. 'elpuoC ddO ehT' is 38 minutes and 45 seconds of backwards grooves all in one track. If you want to your very own free copy, click here.